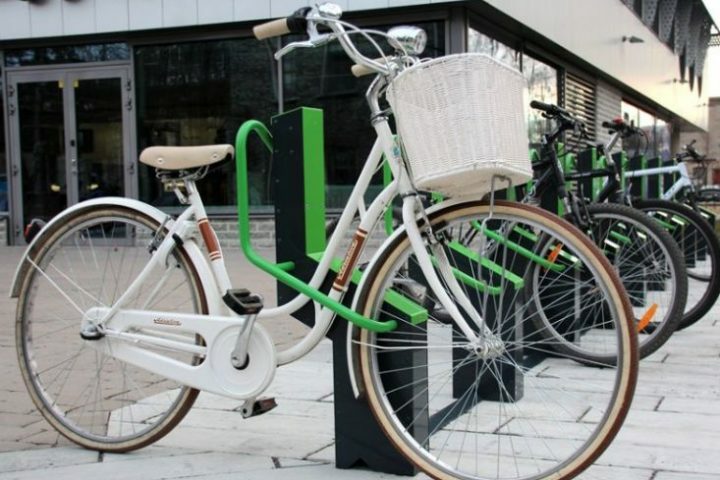 On Rävala Street there is smart and secure parking Bikeep where you don´t need to use your personal bicycle lock. Parking is for free. 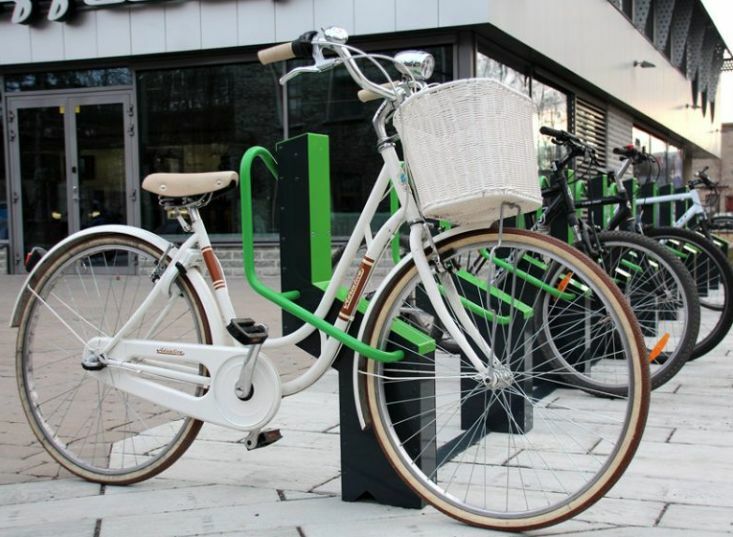 Public transport is a very convenient way to come to Alexela Concert Hall, with stops named Estonia being in the near vicinity of Solaris Centre. Visitors of the Alexela Concert Hall can leave their cars in the parking garage below Solaris Centre. Mark the parking ticket* on the ground floor of the concert hall. Please note that you can only mark your ticket once, otherwise the discount will be invalid. Parking without discount costs 6€/1 h ; 20€/24 h. Price per day 20 € (or 10 € for Solaris Center customer *) is valid only for sequential parking, ie if parked for 5h, the parking price is 20 € and the price does not exceed 24h. There are 233 parking spaces in the parking garage that is open 24 hours a day. Entry to and exit from the parking garage is located on Sakala Street. Parking can be paid for in cash or by bank card using a payment terminal. After the payment you have 15 minutes to leave the garage. In 5 minutes walking distance from Alexela Concert Hall is Rävala parking garage. Parking costs 1,2 € / 30 min (by 30-minute increments). Nightly rate from 9 in the evening until 9 in the morning is 0,3 € / h.
Entry to and exit from the parking garage is located on Rävala Sreet and Kuke Street. There are 600 parking spaces in the parking garage that is open 24 hours a day. 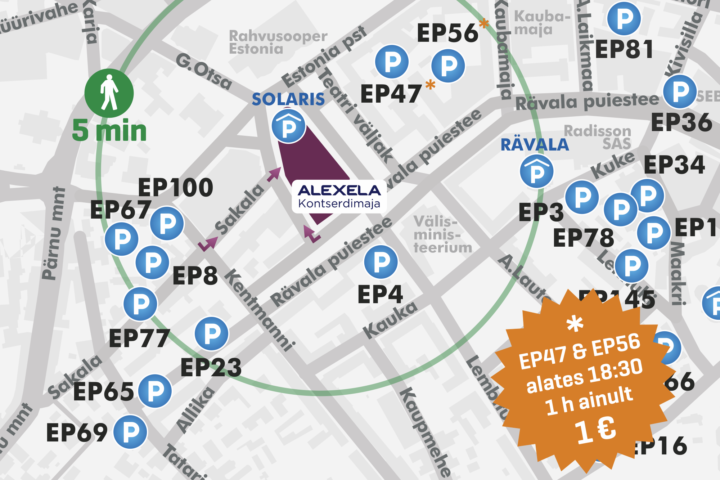 Parking in Solaris and Rävala parking houses is managed by Europark Estonia OÜ. For further information please call +372 66 10 223 or visit www.europark.ee. Groups that visit Alexela Concert Hall can use two marked bus stops for pick-up and drop-off purpose on the corner of Rävala and Krooni Street (see illustrative picture on the left).